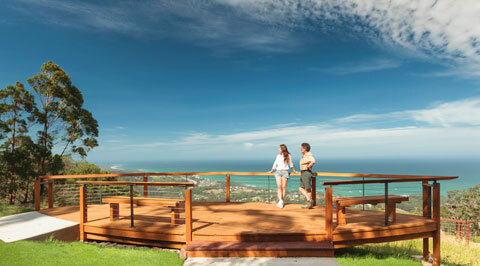 The Forest Sky Pier won best New Tourism Development at the 2012 North Coast Tourism Awards. ,Sealy Lookout then won best tourism attraction in 2015 & 2016. 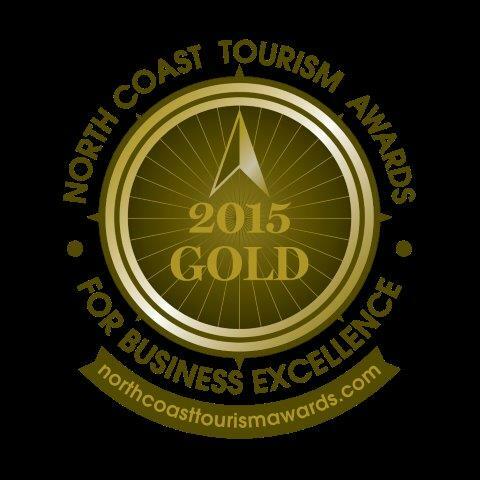 State Forests of the Coffs Coast won gold for specialised tourism services in 2014, 2015 & 2016. These attractoins have also achieved NSW Tourism Awards in 2015 & 2016. Sealy Lookout is located within the ecotourism-accredited Bruxner Park Flora Reserve in Orara East State Forest. Sealy Lookout was originally developed for visitor use in 1968 when the local Lions Club installed BBQs and other facilities at the site. In 1970, during a tour marking the Captain Cook Bicentenary, the royal yacht Britannia docked in Coffs Harbour and Queen Elizabeth II visited the lookout to enjoy the panorama. Forestry Corporation works to continually improve our visitor's experience, adding such attractions as the Forest Sky Pier, Korora Lookout, Gumgali Track, an all-access picnic shelter, improved parking facilities (including coaches), toilets, picnic tables and new walking tracks, including the garaan.gurr walking track. Sealy Lookout is open daily until dusk, and entry is free. 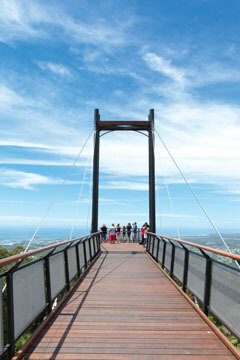 The Forest Sky Pier at Sealy Lookout is a unique way to experience the Coffs Coast and mountain views. 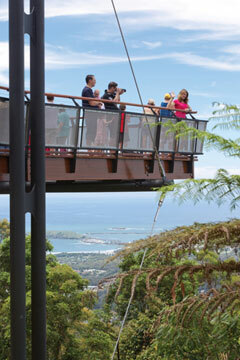 The Forest Sky Pier is located on an escarpment 310 metres above Coffs Harbour and only 9km from the city centre. It projects 21.6 metres beyond the original lookout and offers an expansive vista encompassing Coffs Harbour city, its foreshore and marina, Solitary Islands Marine Park, surrounding mountain ranges and the coastline far into the distance. On a clear day you can see 100km to the south. Adjacent to the Forest Sky Pier, a fully-accessible picnic shelter is available for those wishing to sit, have a cuppa and enjoy the view. From Coffs Harbour, head north on the Pacific Highway for 5 minutes, then take the Sealy Lookout turn-off and follow the sealed road through hillside banana plantations and avocado groves to the lookout turn-off. The Forest Sky Pier is open daily for visitors, includes parking and toilets, is wheel-chair accessible and is free. The Forest Sky Pier is an award-winning tourist destination, having won awards at both the Countrylink North Coast Tourism Awards and NSW Tourism Awards. Korora Lookout is located within Bruxner Park Reserve in Orara East State Forest. Visitors can enjoy spectacular views up the coastline from the viewing deck, or simply listen to the sounds of nature from shaded "church pew" style seating. 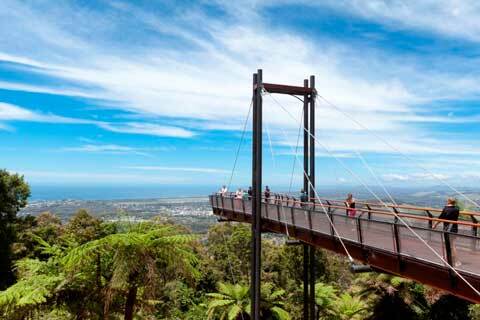 Korora Lookout is accessible via a short ridge-top walking track, which has its own amazing views. Visitor parking is on the Scenic Drive up to Sealy Lookout, just before the Sealy Lookout gates. Korora Lookout is open 24 hours/day, 7 days/week, and entry is free. This small and shaded roadside picnic area features picnic tables and a fireplace. 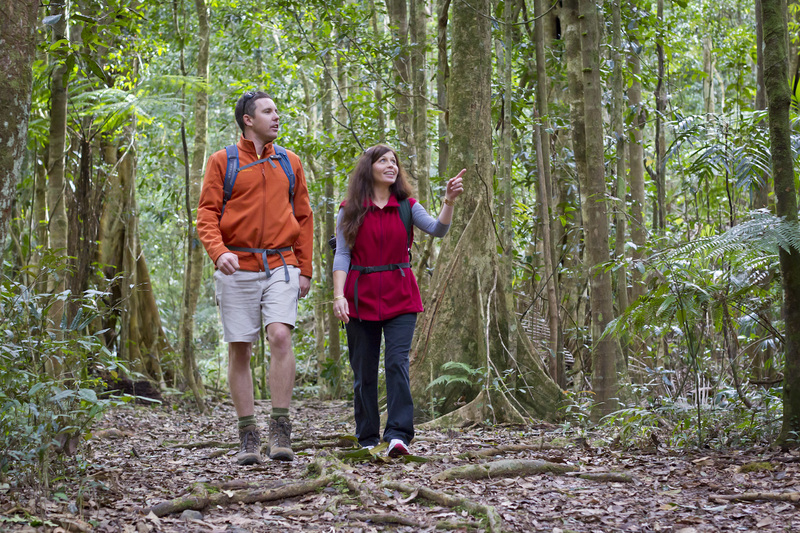 Orara East State Forest walking tracks lead you through the wonder of a subtropical rainforest. Look for giant stangler figs, listen for the songs of the many fruit doves and if you're lucky, catch a glimpse of a bower bird. Tracks are maintained and sign-posted, and some sections include short, steep hills and a varying amount of steps. Some bushwalking experience is recommended. 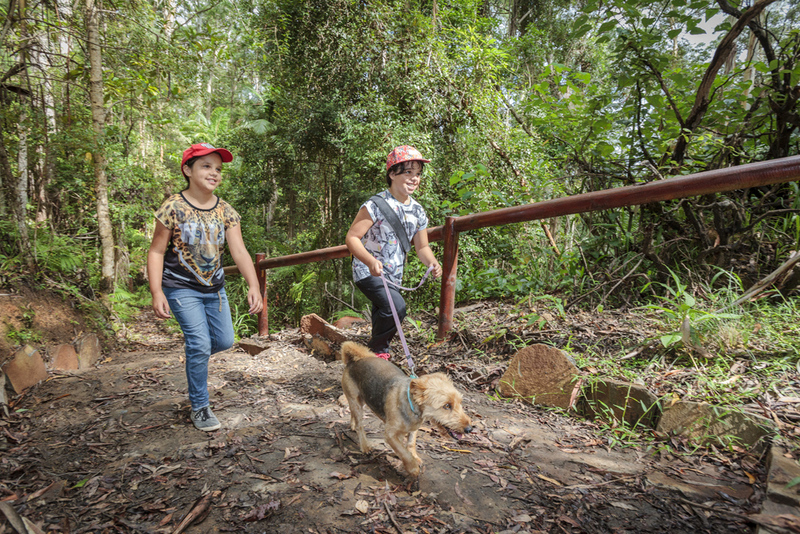 All walking tracks showcase beautiful rainforest flora and fauna. Gumgali Track is a short one-way walking track that follows the ridge line from Korora Lookout carpark through to Korora Lookout itself. This unique interpretive walk tells the story of Gumgali, the Black Goanna, a part of the local Gumbaynggirr culture. Visitors will enjoy locally-designed and made sculpture, mural art, interpretive signage and sound on this track; the sound bar at Korora Lookout offers visitors options to listen to the story of Gumgali in both english and Gumbaynggirr language, a language still strong today. Forestry Corporation wishes to acknowledge the support and generosity of the Gumbaynggirr people in allowing us to share their story. Visitors are also invited to experience the Gumbaynggirr Cultural Showcase. Events are held every month at Sealy Lookout by the Bularri Muurlay Nyanggan Aboriginal Coproration - find out more at www.bmnac.org.au. The Garraan.gurr walking track commences from the picnic area adjacent to Sealy Lookout. This short looped track takes visitors along the ridge line behind Sealy Lookout, showcasing beautiful Orara East State Forest. Bench seating is available along the track. The track loops back to Sealy Lookout near the toilets and carpark via stone steps. 800m, 30 minutes duration, many steps.